Review: "Bellas, George: The Dawn Of Time" - Sea of Tranquility - The Web Destination for Progressive Music! 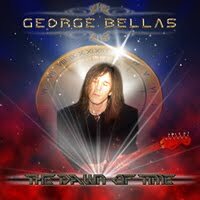 The Dawn Of Time has further finely composed instrumentals from ace guitarist George Bellas, and George has again teamed up with drummer extraordinaire Marco Minnemann for this release. Anyone who has ever experienced Marco's playing before will know what an incredible talent he is, and here once more his drumming is at a level that many may only ever dream of reaching. So this dynamic duo is back with more first rate performances, as they do their part in keeping top notch instrumental music alive and in great shape. I should also mention that George plays both the keyboards and bass on this recording. Some will find The Dawn Of Time easier to digest than his previous release Step Into The Future, as this time instead of one vast song George has actually recorded nineteen assorted tracks for this his latest work, also making The Dawn Of Time a great value release. Credit to George's composing skills as this CD doesn't get dragged down by its duration at eighty minutes due to so much material. Everything is as it should be on The Dawn Of Time for such a recording and the performances sound crystal clear. There are many influences displayed throughout this release, which includes performances of neo-classical and progressive music with different levels of complexity. George even gets his bass groove on for the very cool "Machine Man" but of course there is more than a catchy bass line once the keyboards and guitar kicks in. George Bellas' The Dawn Of Time is sure to be a welcome release by anyone who appreciates skillfully performed music from two master musicians, which is both diverse and imaginative.